This blog was created to provide news and information about Sun City Grand and other Arizona West Valley golf retirement communities. 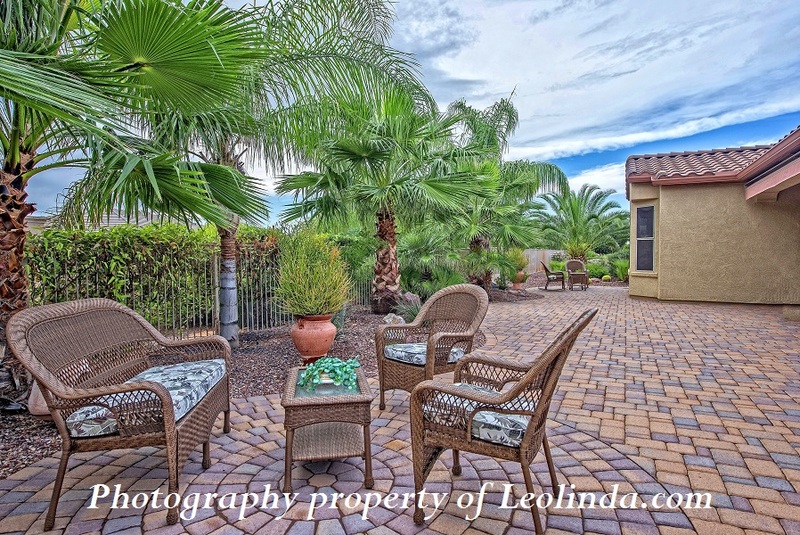 Sun City Grand home, just stunning backyard oasis and indoor elegance! If you are looking for a Sun City Grand home with a private backyard....then this is it!!! Large windows in this Mission Floor plan accentuate views of a private backyard with its tropical palms and strategically placed foliage catering to your privacy needs, and entertaining pleasures! Savor the luxury Kitchen, Built-in Microwave and Wall Mounted Oven, Island, Extra Cabinetry, Slab Granite Counters and Spacious Breakfast Nook. The soft beige color and accent walls bring a sense of refinement. Additional elements include Two Master Suites, Dual Sinks in Master Bath, Master Bedroom Bay Window, Den, Granite Laundry Counter, Laundry Room Farm Sink, Electronic Sun Shade, Extended Garage and Garage Cabinetry. The Massive 1,300 sf Backyard brick paver patio space and two private areas are a Flawless Private Outdoor Oasis with Professional Flair! Enjoy resort living that all your family and friends will love to visit!